Jonny Gould's Soccermongery: Nil-Nil, Jeff! A guide to the mystery world of live TV football without pictures! Nil-Nil, Jeff! A guide to the mystery world of live TV football without pictures! Always keep in mind to broadcast with economy of expression for the remote listener. To do it well takes commitment. So why does telly use inarticulate, untrained ex-players on Saturdays? No one invited me to play midfield for Arsenal or manage Walsall, so why is Paul Merson any better equipped to do my job? If you've watched these shows, you'll know the answer. ..."...they haven't yet, Jeff! ", anti-climaxes Merse. "Ashley Young gets it halfway, skins Matty Upson, it falls for Umbongalore who has a crack, Jeff, but Rob Green does well... turns it away for a corner; nil-nil, Jeff". Of course, ex-player's "media careers"are pigeon-holed into a narrow range of tasks. 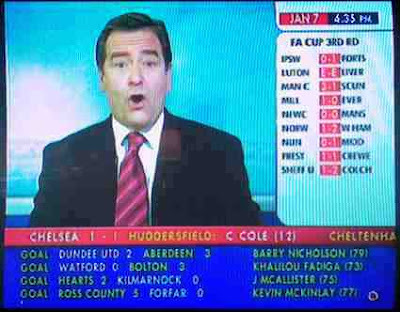 There's not one ex-pro that could hold that live show together like the exceptionally live Jeff Stelling. Believe me, I did the same show: ITV's Football First. Four hours of non-stop updates, my brain agog with how many since Agogo scored and when Huddersfield last won at home. And by the way, there's no recorded sighting of a commentator who used to be a player either. You get a guest summariser, that's only so the brilliant and thorough Alan Parry can have a glass of water! I guess I resent the knock on the studio door by ex-players saying "I'm 36, I'll have some of that", without taking it seriously and doing the yards, the homework, learning the broadcast skills-set. "W e played the game, we know what we're talking about! ", an Andy Gray-style rambling which divides the world up into two categories: "football people" and the rest of humanity. It's a disdain for his fanbase as though we're watching him to be put right because we couldn't possibly understand having not been a pro. Almost geraldratneresque, Andy. No wonder, he got the bullet. Pure hubris: pride came before the fall. My message to ex-players. You're not necessarily blessed with extra knowledge! I bet you couldn't o rganise a live show in a brewery. Let me tell you, Andy Gray: I've watched football, reported football and played football (with enthusiasm if not technical brilliance) long enough (by the way, I'm actually descended from "football people" too. Are you? Is it hereditary?) and therefore, your qualifications over mine must be tenuous at best. I always admired Bob Wilson's attempt at on-air orthodoxy. 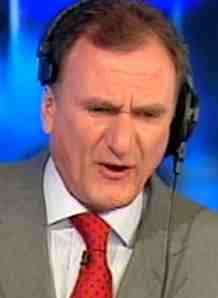 He was functional on 1980 Football Focus, but he did resemble a broadcaster and he deserved his job. Jimmy Hill too, an intelligent man who genuinely leveraged his "football people" knowledge into opinion and comment when MOTD was a single shot in front of tan wallpaper. But he never let it spill over into the shows raison d'etre. It took Gary Lineker ages before they turned him into on-air quality; even now he's a one-trick pony. You know that iron statue of Saddam with the outstretched arm they tore down when he was overthrown? well, that's Gary on-air! He's not asked to do complicated - but he's fine. Nope, they're not listening to me. Andy Townsend's fronting ITV, Mark Bright frankspencer's his way across droney local telly and Garth Crooks frowns through The Red Button like he's talking Iraq - not Stoke. The trend's here to stay. So I'm cleaning my boots and I'm going to get myself a professional game. Oh, I'll do the work alright. I'll go to the gym, shoot with my left foot for hours, give and go - and try to perfect the glancing header. I'll find a game at my level too. Now, who are Birmingham City playing Wednesday night? Also on Soccermongery: Carragher's "bottler" talkSPORT moment (podcast) and Massive debts run by the big 4 will see Change We Can Believe In! Nice to see you on this opitcal illusio for the mind, which we call the internet. And as long as you don't slag off Le God you will be fine by me. The comments of ex-pro footballers usually add very little to a broadcast because they're so inarticulate and generally unintelligent. There are ex-pros like Keown and Dixon on MOTD2 who are the exception to the rule but generally the Merses of the world rule the roost. One question - why do the ex-pros depise the adverb? "The boy done super" etc. For a masterclass, they should listen to how the Germans and Scandinavians speak English! Dixon is ok. When asked a question, Keown's eyes give away the fact he is terrifed and just hopes he can remember the stock answer. You think Sky Sports are bad at this sort of thing? Try my former employers, BBC Radio Wales. During my time there, the policy was to cover the three Welsh Football League teams with full commentary on FM frequencies in their locality: Cardiff, Swansea, and Wrexham, (who had just been relegated to the Blue Square Premier, but commentaries continued as before). These would be covered by a professional commentator and a summariser, as you’d expect. Then, there was a ‘goal alert’ and rugby update service on MW, which I worked on as a researcher (eventually paid), along with several others. The policy was to send reporters to a selection of Premier League games, where there was some vague Welsh interest (a Welsh bloke on the subs bench at Blackburn was usually enough to merit sending someone). Under any sane regime, us researchers would’ve been asked to submit demo tapes of match reports, while being given encouragement and support from senior colleagues, with a view to us being sent out to cover games when ready. I can’t recall a single occasion where anything like this happened, or was even encouraged. Instead, they would send ex-professional players to these games, who, with the notable exception of Kevin Ratcliffe, weren’t particularly well-known. Most of them played for either Cardiff or Swansea for a few years in the 1990s, during that long period when both clubs were in the lower leagues. Some of the characters they used made Chris Kamara and Paul Merson sound like masters of the English language. I can recall one occasion when they sent a particularly inarticulate ex-footballer to cover a game involving West Ham. Our producer that day was someone I hadn’t seen before or since, but I quickly realised he was pretty good. During the course of the afternoon, we crossed over to Upton Park on three or four occasions, and each time we were ‘treated’ to his updates, which consisted of habitual use of the present tense to describe past events, and words slurring into each other. When I saw the highlights on Match of the Day later that night, I also discovered he was somewhat prone to exaggeration, making certain incidents sound far more significant or interesting than they actually were. When we got past 5 o’clock, and the match reports were due in, the producer asked me to cut and lift the report 5 Live were using at Upton Park, saying we’d heard enough of our own chap for one day. Needless to say, they continued to hire his services……..I have no idea what happened to the producer. Incidentally, the current Head of Sport is the first in the entire history of BBC Wales NOT to be a former Welsh rugby international. I could say a hell of a lot more about the way that place operates. Let’s just say I don’t think it’s a coincidence that most of their best producers and commentators have moved on in the last few years.